The Endangered Species Print Project (ESPP) was recently initiated by artists Jenny Kendler and Molly Schafer to offer limited-edition art prints of critically endangered species. 100% of sales are donated to specific animal conservation organizations. ESPP launched in July of this year, and as of now is just 2 print sales away from raising $1000 to conserve critically endangered species! Editions are limited to the species’ roaming population count- for example, only 45 Amur Leopards remain in the wild, so only 45 of their Amur Leopard prints will ever be made. 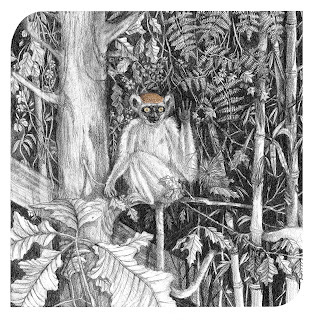 Their latest release is this Golden-Crowned Sifaka Lemur print, by artist Jerstin Crosby. It’s a 8 X 8″ square with two rounded edges.This lemur’s population has plummeted this year due to a political coup in Madagascar. Without a central government, there is no one to enforce laws. Illegal poaching has resulted in endangered lemurs being killed by the hundreds for the bush meat industry. Go here to check out their 6 other prints/animals needing support.